Hazen is just minutes from beautiful Lake Sakakawea, the Knife River Indian Villages NHS and several coal mines and energy plants. The town along the Lewis & Clark Trail has most everything the traveler needs including a well-rounded business district, a variety of restaurants, medical facilities, retail, and many other services. Hazen is located along Highway 200 midway between two North Dakota state designated Scenic Byways. Visitors to the area are encouraged to try the authentic German menu items offered at the local restaurants. The North Dakota Legendary hospitality and the designation of being the friendliest state in the nation will off er a vacation experience far beyond your expectations! 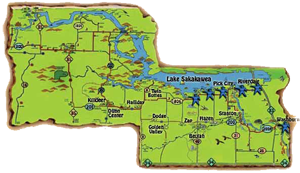 Hazen is very proud of its camping facilities at the Lewis & Clark RV Park on West Main, Antelope Creek RV Park North of Highway 200 and at the Hazen Bay Recreation Area 12 miles to the north on beautiful Lake Sakakawea. The RV Parks have level pull through sites, handicap accessible comfort stations with showers, toilets, laundry facilities and meeting rooms. The Hazen Bay Campground has primitive and modern camping sites, cabin and RV rentals, boat ramps, fish cleaning station, picnic shelter, playground and convenience store with gas. Sewage dump stations and free WiFi are available at all three campgrounds.